Here I am again doing what I like most: baking with yeast, and this time I am making a loaf of bread. 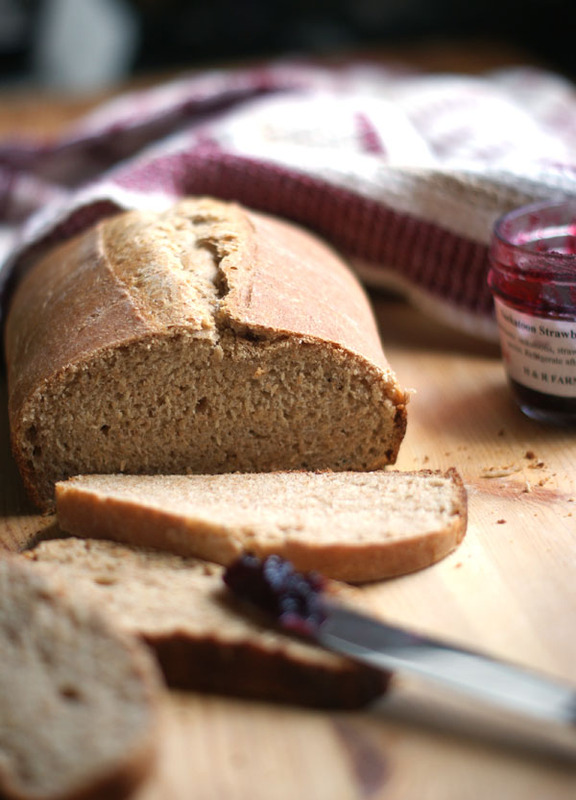 Baking with yeast lets the artist in you come out. It is somewhere between meditating and sculpting, where the sublime meets the art. Your first loaf may not be beautiful or succesful, but its smell and taste alone are enough to transport you and improve your mood. Turning a lumpy mess into a loaf of bread is incredibly satisfying. The bread you bake will be your own, it will reflect you and no one else because of the infinite number of variables you affect, either consciously or unconsciously, as you bake: the more or less precision when measuring and adding ingredients, the length of time you spend kneading, the temperature outside and in your kitchen, the color and size of your bread pan, the size and age of your oven. A decision to bake bread implies spending almost an entire day in its service: measuring and combining exactly flour, yeast and liquids (the only other ingredients being sugar -or honey in my case- and salt), kneading the dough, letting it rise once, peeking under the towel, punching it down, letting it rise a second time and finally cooking it in a preheated oven. I found this recipe on the Kitchn and it called for 2 loaves, but I didn’t have two bread pans, so I decided to half the recipe. I usually do not like doing that, as it affects the entire outcome, but had to. As expected, mine did not rise as much: my kitchen was probably not warm enough, outside was a grey gloomy day, moreover I wasn’t really precise in halfing the recipe. For the second rise I also waited more than the requested 30-40 minutes (1 and 1/2 hours for me), but it still didn’t rise dramatically. I didn’t use a stand mixer, just a wood board and my hands. That is the part that I like most: the flour will spread everywhere and it will be so much fun! 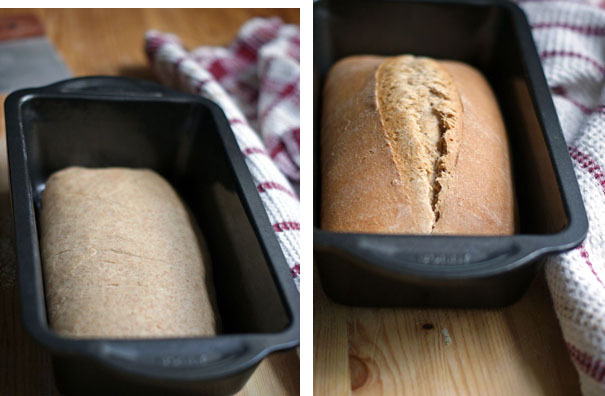 The whole wheat bread baking in the oven will make your house smell incredibly good. I couldn’t wait to try it, I didn’t even wait for it to cool down a bit, I just sliced it and gnarled the crunchy end. It tasted delicious! I am not a bread and butter kinda girl, but I am a jam on bread girl for sure, so I took out a Saskatoon Strawberry jam from H&R Farms, and spread it on a second slice of bread. It is sooo good! 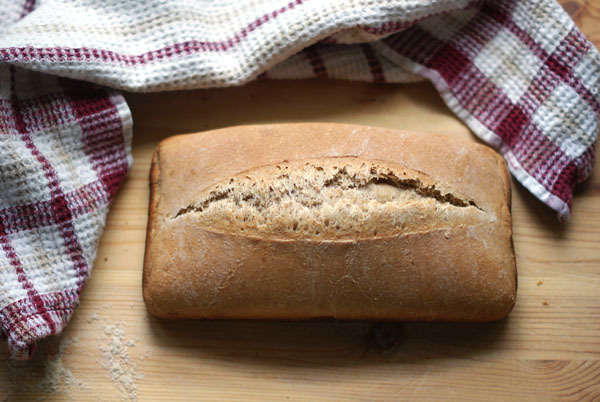 The outside has a beautiful crispy crust, the inside is dense but soft and pillowy, the taste is mildly savoury with a hint of sweetness and a backdrop of nutty. 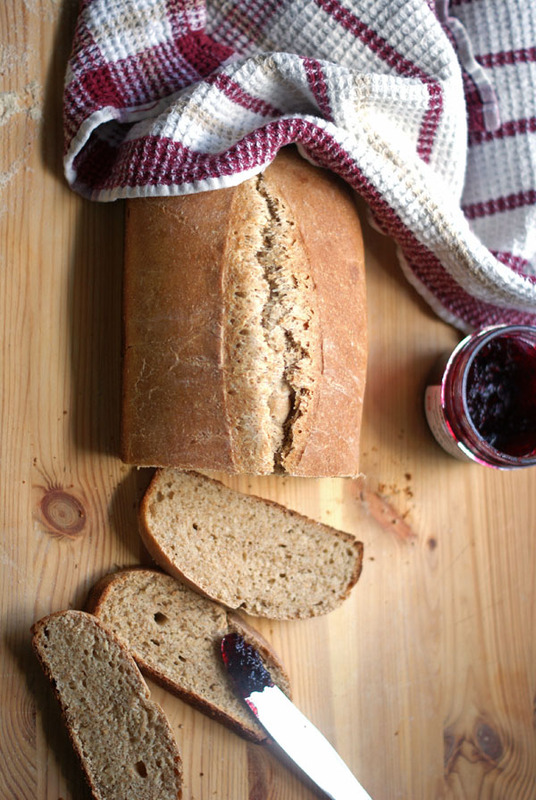 Definitely a breakfast bread, perfect toasted, with almond butter and jam spread on top. 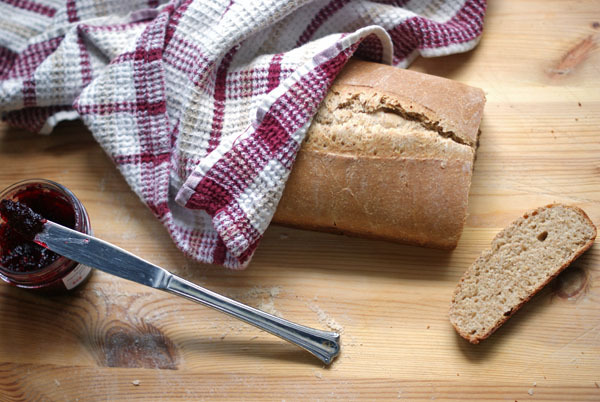 Enjoy your whole wheat bread, one of life’s simple pleasures! The recipe is from the Kitchn. Pour the water into a mixing bowl and sprinkle the yeast over top. Let this stand for a few minutes until the yeast has dissolved. Stir in the milk, honey, and oil. Add two cups of all-purpose flour and the salt, and stir to combine the ingredients. Add the rest of the all-purpose and whole wheat flours. Stir to form a shaggy dough. Let this stand for 20 minutes to give the flour time to absorb the liquid. 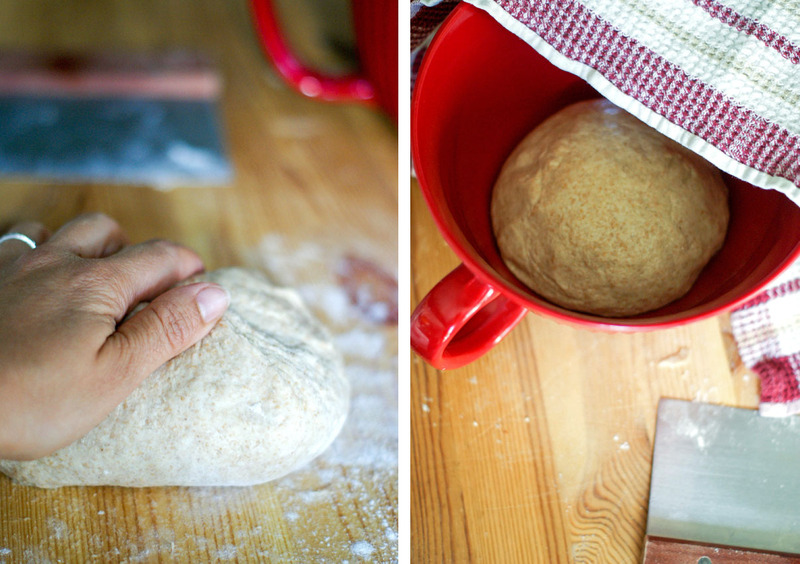 Knead the dough by hand for 8-9 minutes. If the dough is sticky add extra flour a tablespoon at a time until it is no longer sticky. The dough is kneaded when it is smooth, forms a ball without sagging, and springs back when poked. Clean out the mixing bowl and film it with a little oil. Form the dough into a ball and turn it in the bowl to coat it with oil. Cover the bowl and let the dough rise in a warm spot until nearly doubled in bulk, about 1 – 1 and 1/2 hours. This dough won’t double quite as dramatically as other recipes, but the dough should look visibly puffed. Slash the tops of the loaves with a serrated knife and put them in the oven. Immediately turn down the heat to 375°F and bake for 30-35 minutes. Finished loaves will be dark golden-brown and sound hollow when tapped on the bottom.